In case you didn’t know, Estonian women are stunning! How else would you explain that if you run an Internet search for Estonian bridges, Google may ask: “Did you mean Estonian brides?” Well, no, we didn’t, albeit we understand the confusion. Perhaps there will be a blog post on that topic, too. Or maybe not. “Homeland,” the Showtime spy thriller series, is famous for its mindboggling finales, and Season 7 was no exception: a dramatic prisoner exchange, during which the main character, Carrie Mathison, is released by the Russians after 7 months of solitary confinement. She runs across a bridge to meet her longtime boss, Saul Berenson, only to rush right past him, not recognizing her old friend and colleague. “Are you all right?” Saul asks her, trying to catch her eye. She looks back. Confused, her eyes darting over Saul’s face, and does not respond. Yes, our bipolar heroine has at last gone mad. The startling last scene of Homeland Season 7 took place on an “Estonian” bridge–an ideal location for prisoner swaps like this. There is indeed a bridge over the Narva River, which forms the border of Estonia and Russia. But the scene was shot somewhere else, perhaps Southern California, where someone must have thought it made more sense logistically. But to an Estonian, it lacked verisimilitude! The Estonian Film Institute, a national foundation financed primarily by the Estonian Ministry of Culture, boasts an incentive that supports the production of feature films, feature documentaries, animation films, animation series, high-end TV-drama, and the post-production work of all of those genres. Film companies can submit an application for international production services or co-production to receive a cash rebate up to 30% on eligible production costs. Sound good? It should! There are many more bridges for swapping prisoners and everything else in Estonia. Consider the Viljandi suspension bridge, for instance. Erected over a valley as deep as 50 feet, the 165-foot long bridge is an architectural stunner, making it a perfect spot for lovey-dovey encounters, so should you be planning your next romcom, consider this marvelous overpass. For a more urban (and even eerier) experience, visit Kuradisild (Devil’s Bridge), made of dark concrete. 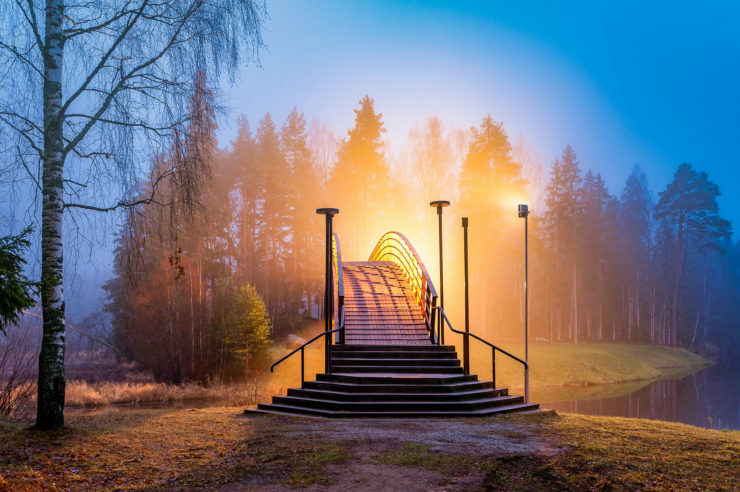 It’s in Tartu, the second-biggest Estonian city, and it’s one of the few remaining concrete bridges built in the early 20th century. It was originally erected to commemorate the 300th anniversary of the Romanov Dynasty, the second dynasty to rule Russia. As for the “satanic” name of the bridge, the origin is unclear. It may have been derived from its dark, or maybe it’s the contrast with a nearby (and much lighter) Angel’s Bridge. Whatever the reason, the Devil’s Bridge moniker should be cool enough to attract any movie maker. And then there’s the Rapla Stone Bridge, conveniently close to Tallinn, the capital. This bridge is the only one of its kind in the country, and it’s being used as an entertainment compound of sorts: There’s a coffee shop under the bridge with a simple, unique dress code: You have to wear galoshes to get in. River rallies are also held on the river under the bridge while performances are held on top. So remind Showtime and all the others that when your script requires an Estonian bridge, use a real one. It adds immense verisimilitude since it’s the real thing, and, who knows, it might give you the inspiration you didn’t know you had!